On Friday, October 26th, I attended the New England Archivists’ (NEA) Fall Meeting at the John F. Kennedy Presidential Library in Boston. 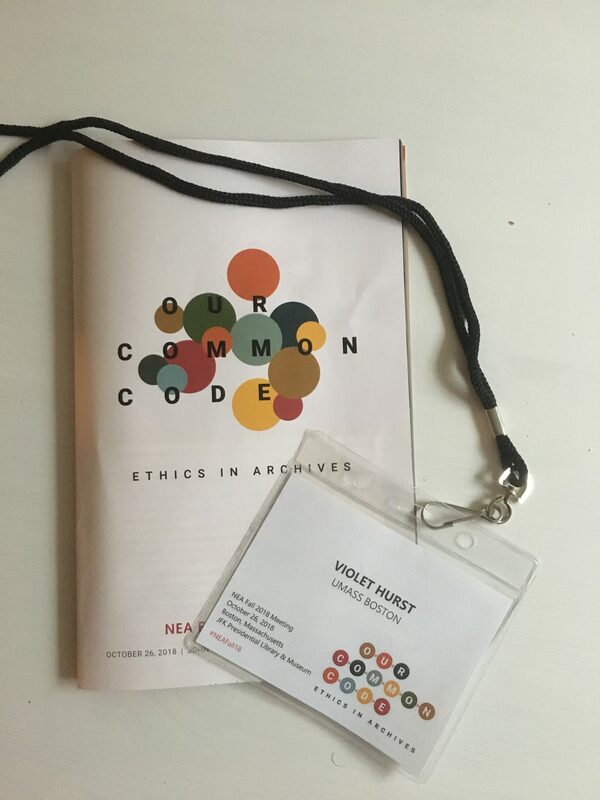 The theme of the meeting was “Our Common Code: Ethics in Archives,” and it gave archivists and allied professionals the opportunity to discuss archival ethics in three areas: appraisal and acquisitions, description, and access. As a second-year graduate student in the Archives Track of the history program at UMass Boston, I wanted to attend the Meeting in order to learn more about current ethical issues in the archival profession. 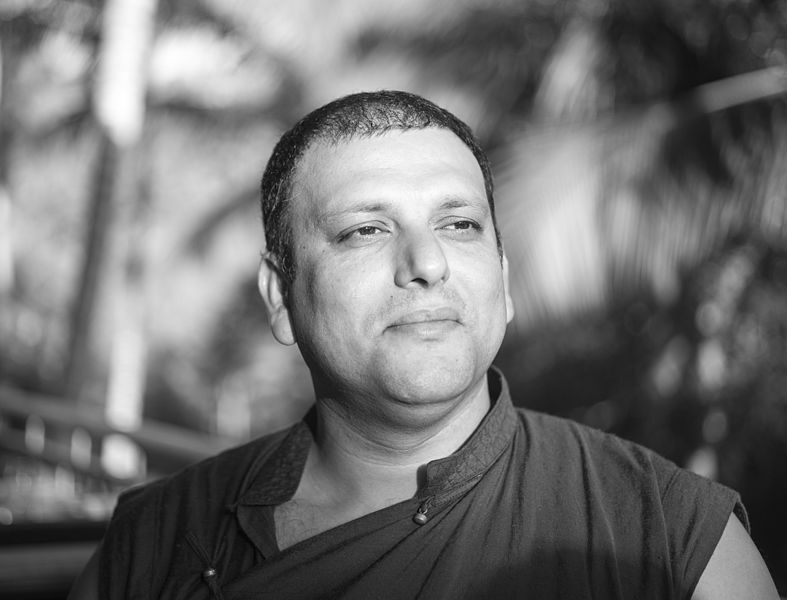 I looked forward to listening to panelists discuss their experiences and share their knowledge, and I was excited to hear the plenary address by the Venerable Tenzin Priyadarshi. I was excited to being surrounded by a community of professionals who cared about such things as ethical issues, something that many professions overlook, or even actively ignore. But I knew that there was another, more anxiety-inducing reason that I, as a graduate student and soon-to-be job-seeker, was attending the conference: to network. The Venerable Tenzin Priyadarshi. Photograph by Christopher Michel, 2016. Since early high school, I have struggled with moderate social anxiety that flares up when I am confronted with unfamiliar, public social situations. At academic conferences, I feel a sense of inferiority as I am confronted with a sea of (seemingly) confident students and professionals. I find it difficult to start conversations with people whom I’ve never met, especially when there is the pressure to appear knowledgable, interesting, and in all ways hire-able. I feel overwhelmed by the constant need to be “on”– from when I’m making connections with professionals in the field to when I’m pouring myself a cup of coffee in the conference reception area. Despite my anxiety, I find it both personally rewarding and professionally necessary to attend academic conferences like those hosted by NEA. At conferences, students like me have the opportunity to learn from the real-life experiences of archivists in the field. We are able to participate in conversations about the most current trends and issues in our chosen career. We can ask questions from those who have worked in the field for years, and we have the opportunity to learn from a rich diversity of people. Most importantly, we have the opportunity to introduce ourselves, for the first time, to members of the tight-knit archival community. During my undergraduate education in history, I lived under the blissful impression that networking was something that only those entering the business and finance world would have to face. It was only in graduate school that I learned that networking is an inescapable aspect of entering the professional world that very few students are able to avoid entirely. Over the past year and a half, I’ve had to attend conferences, workshops, community events, and informational interviews that took me out of my comfort zone, and along the way I’ve formulated strategies to deal with my anxiety in these situations. I share them here in the hopes that they might help others with social anxiety navigate the academic conference. 1. Look for the familiar. When attending an academic conference or workshop, there is a lot of pressure to spend the whole day making connections with new people and entering into new spaces. It can be useful to take a minute to remember that not everything about the conference is new and overwhelming. There is bound to be a face in the crowd you recognize, or a event space or setup that is familiar– or even a brand of complimentary tea that you like. Making yourself more comfortable in a new space goes a long way toward making you ready to interact with new people. At the NEA Fall Meeting, I was lucky enough to recognize several faces in the crowd from previous internships and from my graduate program. 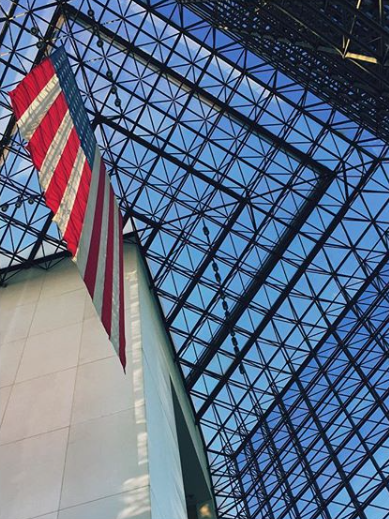 I was also very familiar with the building and the conference space at the JFK Library, having interned there from May 2017 to August 2018. These things made me feel like I was on solid ground and made me comfortable enough to engage with elements of the conference that were unfamiliar. Eliminating your uncertainty about the structure of the day is another way to make you more comfortable at a conference. At most conferences, a full schedule of programming is readily available in programs or handouts at the registration desk. Knowing in advance when breaks are and whether you will have to get up and move around for different sessions can help the day go more smoothly. I also like to look at the topics of upcoming panel discussions or presentations in advance in order to start thinking about things I may have to contribute to the conversation. I never used to know what to say when starting a conversation at an academic conference. It can feel so unnatural or even awkward to walk up to someone you’ve never met and start a conversation. Fortunately, conferences provide you with plenty of material to talk about. I find that it’s useful to take notes about things that spark my interest during presentations and discussions. Then, during breaks, lunch, or other unstructured time, I can turn to someone and say something like “It was so interesting when ___ talked about ___. Have you encountered a similar situation in your work?” If I’m feeling really bold, I’ll even seek out a presenter to ask a question or have a discussion about the themes of a particular presentation. I took a lot of notes in order to discuss Jennifer Bolmarcich’s presentation on “Heavy Small Collections” with my tablemates at the NEA Fall Meeting. Despite my fears, I’ve found that most people are excited to talk more about their work and their experiences. 4. Don’t be afraid to take a break during breaks. This may sound non-controversial on its face, but traditionally, breaks at conferences are considered the time to network. If you’re comfortable enough to network during breaks, go for it! But if you need to take some time for yourself, absolutely do that. Find a quiet spot to clear your head and decompress for a minute– even if that quiet spot is in your car or a bathroom stall. Taking time to recharge will make you more ready to go out there and network at other times, like during lunch or transition periods. If you walk away from a conference kicking yourself for your inability to network, remember that it’s still good that you went. If all you do at a conference is listen and learn, you’ll likely walk away from the day with new ideas, perspectives, and questions that will make you a better professional in the long run. Perhaps you’ll even emerge with a better sense of which people and institutions are doing work that aligns with your interests. It’s also important to remember that not all networking happens at the day of the event. You may meet presenters or participants at some point down the road (it’s a small [archives] world, after all), and you’ll be able to refer back to having heard or encountered them at a previous conference, workshop, or community event. We at the UMass Boston graduate program in history are pleased to announce that an article by recent alumnus, Edet A. Thomas, has been accepted to the Pardee Periodical Journal of Global Affairs. Edet’s article will appear in the journal’s forthcoming Fall 2018 issue. A full abstract of his article is below. Congratulations to Edet! This paper examines the portrayal of Nigerian women involved in the illegal international cannabis trade by the Nigerian newspaper press between 1970 and 1980, to offer new perspective of historical scholarship on Africa’s role in the global drugs trade. Besides citing oral sources, the researcher analysed news reports, opinion articles, letters to the editor and pictures as published in Daily Times, New Nigerian, West African Pilot, Daily Express and The Punch. Findings suggest that the managers of the newspaper press, guided as they were by patriarchal notions of how women should behave in traditional Nigerian society, took liberties in sensationalizing stories about the suspects. In terms of extent and intensity, there was far more press coverage of cases involving women, who made up only 2% of the 1,169 persons convicted for cannabis-related offences between 1966 and 1975. The paper demonstrates how prevailing socioeconomic conditions shaped the press’s framing of women’s drug-related activities in an era of relative economic prosperity. On a quintessential fall day this past October, the UMass Boston Labor Resource Center held a memorial lecture in honor of the late Dr. James Green. Dr. Green, the celebrated historian, author, and activist, was a beloved member of the UMass Boston faculty and the Boston labor community. The event featured Professor Patricia Reeve of Suffolk University, who spoke to an enthusiastic audience about the contemporary labor landscape in Boston and Jim’s legacy in the field. As first-year public history MA students, we responded to the Labor Resource Center’s call for volunteers to lead a labor history walking tour in downtown Boston. This was also an opportunity for us to learn about Jim Green’s work and legacies as a movement historian. As a scholar of new labor history, Jim brought together scholarship and his commitments as a public historian. He brought a people’s history lens to Boston’s historical landscape in 2001, when he planned and wrote the “Working Peoples’ Heritage Trail,” a driving tour of Boston’s labor history sites from colonial times right up to the present. In 2017, a recent Harvard PhD, Cristina V. Groeger, revised and updated the tour. Her project resulted in digital access to the sites, facilitated by an easy to follow google map, both of which can be found here. Groeger spoke briefly at the memorial event about the creation of the website and then handed the microphone over to us to introduce our tours. We were a bit intimidated, as neither of us are labor historians or active in the labor movement. We knew we would be talking to experts in the field, leaders in the community, and people connected to Jim’s legacy. But as aspiring public historians, we enthusiastically embraced the challenge. In planning our tours, we divided up the sites, so we offered the participants two different experiences. 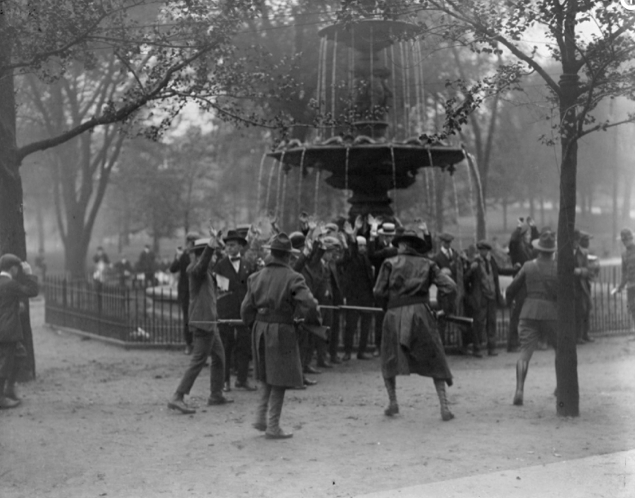 Adam (having only lived in Boston for a grand total of a two months) kept his group focused around the Common. This part of the tour brought the group to well-known Boston landmarks, but interpreted them through a labor lens. Heading in the opposite direction, Madison took her group down through the theater district, Chinatown, and the old Garment District. Her tour had very few extant buildings, but brought people to lesser known sites and illuminated their hidden histories. 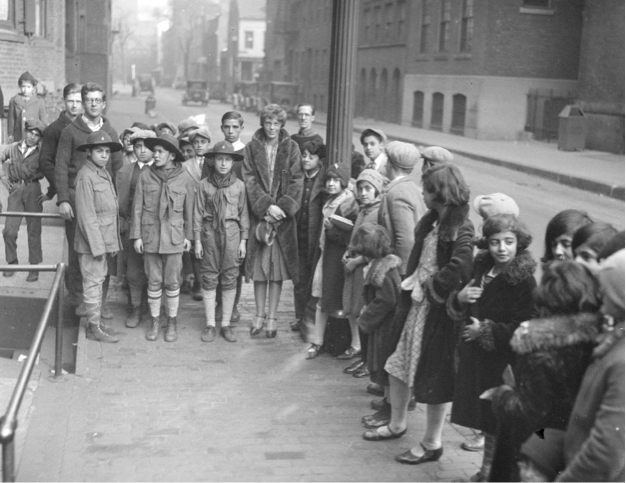 Amelia Earhart returns to Dennison House on Tyler Street where she is greeted by children of all nationalities. Despite the anxiety of keeping groups together through construction sites, yelling over jack hammers, and illustrations blowing away in the wind, both tours were successful and rewarding. Our groups were engaged in the information we presented, and excited to see Boston through a new lens. 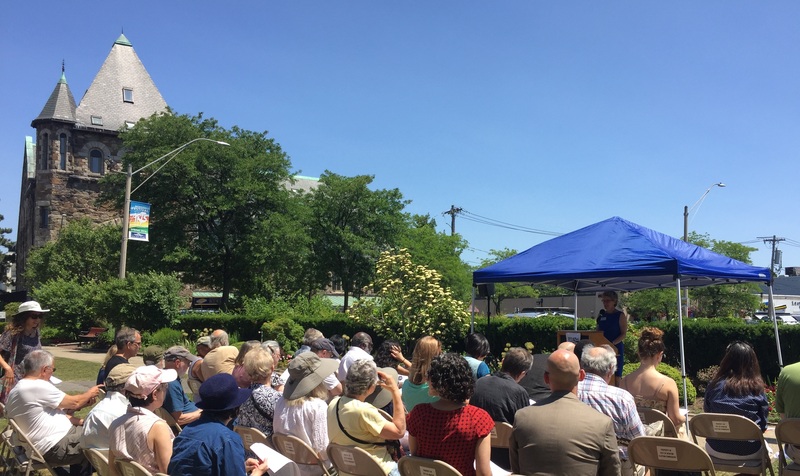 Madison’s audience loved hearing about the time that Amelia Earhart, a short-term employee of Denison House, a social settlement on Tyler Street, flew over Boston scattering leaflets about a Denison House event. They were also very curious about the development of Chinatown as a center of labor, and the community’s efforts to preserve their unique culture. Many of the participants were involved in the labor movement themselves, so when we were not able to answer specific questions, we deferred it to the group at large. This encouraged dialogue and critical thinking, and generally led to rich group discussion. 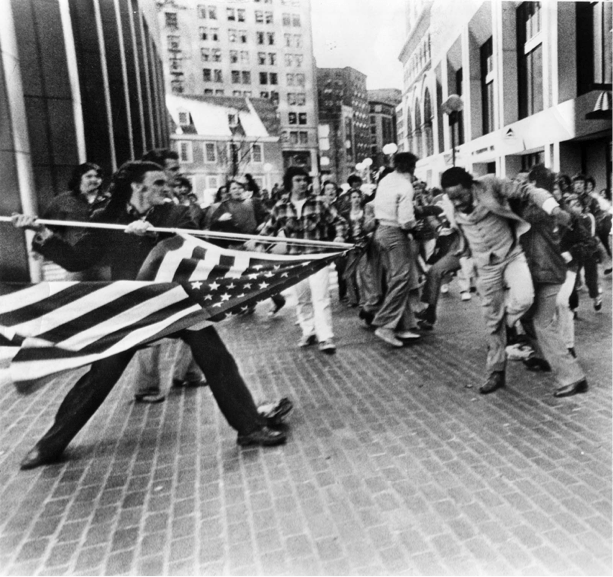 “Soiling of Old Glory” depicting Joseph Rakes assaulting Ted Landsmark, a civil rights activist and lawyer, at Boston City Hall. Photo credit to Stanley Forman/Boston Herald. ways in which Boston’s busing crisis is remembered, or not, as the case may be, through public displays and in our collective consciousness. We also considered the complicated history of African American struggles and contributions to Boston’s historical landscape. These conversations with our tour participants reflected their deep interest in thinking about how to complicate our narratives and tell hard truths. We are pleased that the Labor Resource Center has offered us the opportunity to lead tours again in July 2018. We are delighted that our continued participation in this project gives us the opportunity to continue developing our skills as public historians while keeping Jim’s legacy alive. In his many writings, Dr. Green called for scholars to be stewards of historical knowledge and make history accessible in causes for social justice. We have taken those ideas to heart. It was a distinct pleasure to learn about his perspective on history and to experience the challenges to personal and popular narratives of history, posed by a people’s history tour. The entire experience provided a lesson on how each individual and community shapes their own histories, and the importance of the contributions and agency of those relatively invisible in the historical record as the true agents of important historical moments. As historians, we play a role in shaping these narratives, and Jim’s work reminds and challenges us to live up to our responsibilities to and the promise of collaborating with our communities. 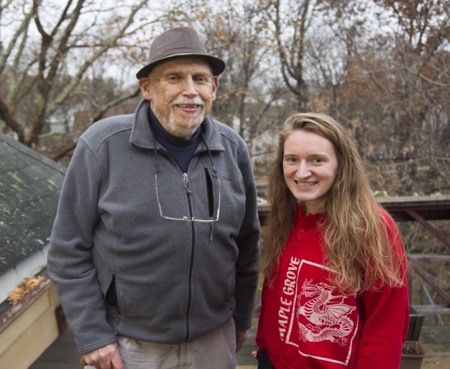 We are excited to announce that the Dorchester Reporter recently published an article about an upcoming exhibit curated by public history student Sarah K. Black. You can find it here. 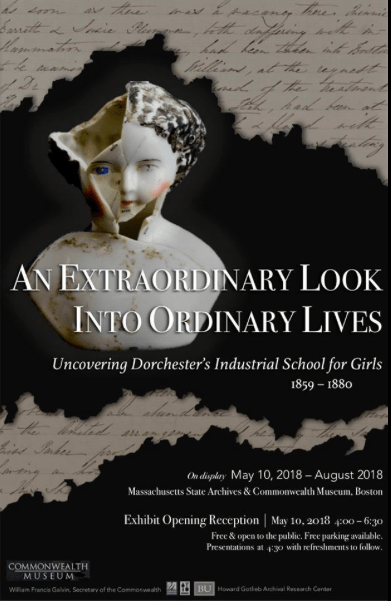 Sarah’s exhibit, which is entitled, “An Extraordinary Look into Ordinary Lives: Uncovering Dorchester’s Industrial School for Girls,” explores the first decades of Dorchester’s Industrial School for Girls, touching on daily life at the school, gender roles, class dynamics, and race relations. It will also feature dozens of artifacts recovered during the archaeological dig performed on the site in 2015. The opening reception will take place at the Massachusetts State Archives & Commonwealth Museum on Thursday, May 10th. I moved to Boston from California two years ago because of a love of old boats and cobblestones (yes, really). 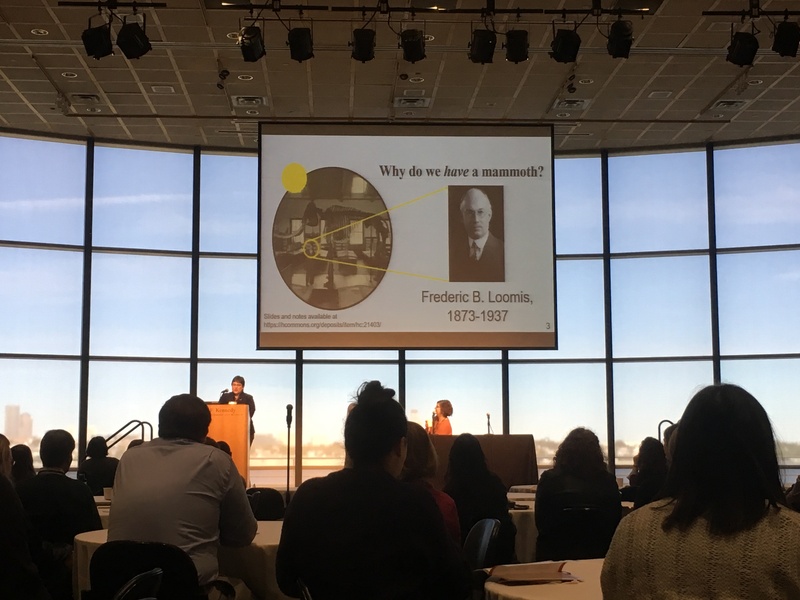 Fortuitously, I sat next to Jennifer Zanolli, Manager of Interpretation and Visitor Services at the USS Constitution Museum, during a session at the New England Museum Association (NEMA) conference in November 2016. A year later, I was lucky enough to work with Jennifer as a museum education intern at the USS Constitution Museum. My primary responsibility was brainstorming educational programs to implement on USS Constitution. The goal was to create a program on the ship itself based on an existing program at the museum. We envisioned this complimentary program as a way to help visitors identify and make connections between the museum program and its context in this historical setting. Since hands-on learning is a hallmark of the USS Constitution Museum, any new program required appropriate and meaningful strategies for audience participation. I faced this new challenge right away, since the precise details, or even the general structure, of this program were unknown at the start of the internship. Previously, the Constitution Museum had not had access to the ship for its educational programs, so my task was unprecedented. However, the format of the program would follow that of existing gallery guides for programs in the museum. This exciting new opportunity became possible through the combination of an amenable commanding officer, and a grant to fund collaboration between the US Navy and the USS Constitution Museum. “All Hands” call, US Navy on the USS Constitution. Public domain image. The USS Constitution Museum has won numerous well-deserved awards for their interactive and highly engaging exhibits since they opened in 1972. The museum’s primary focus is USS Constitution and everyone whose lives were touched by the vessel’s construction and commission. It is located next to the ship itself, in the Charlestown Navy Yard. 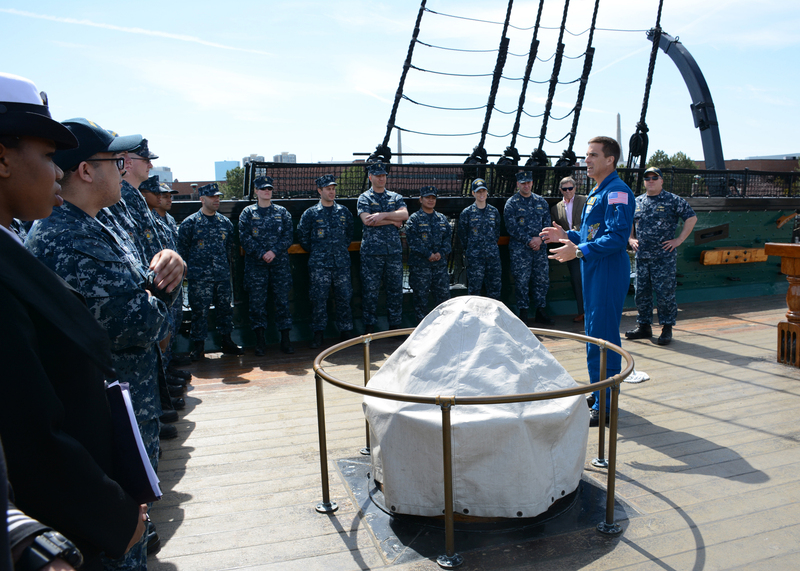 The museum’s mission statement boasts a commitment to scholarship and innovation, as well as providing hands-on experiences that keep the stories of USS Constitution and those associated with her relevant. Because of the intimidatingly high bar the museum has set for engaging and interactive exhibits, I had the challenge of creating ideas that would be within the realm of possibilities, but also the encouragement to think big. I approached the task by researching and brainstorming programs suitable for the ship, interacting with and observing the different galleries and programs in the Constitution Museum, and attending museum educator meetings. 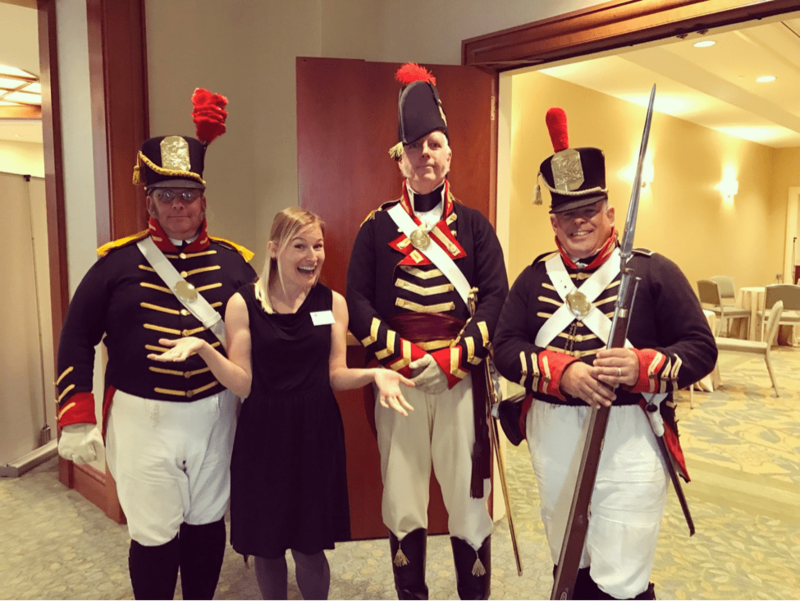 Genevieve Wallace posing with 1812 Marine reenactors during the USS Constitution Museum’s annual fundraiser. October 18, 2017. Courtesy of Genevieve Wallace. I began my research began by exploring programs at other maritime museums to identify possible on-ship program models. This offered limited information, because many ship museums are able to offer sailing tours that Constitution cannot, and the ones that don’t (like the HMS Victory) offer visitors open decks to walk through, but no educational programing. I turned back to our own exhibits and programs in the museum for inspiration, but I still didn’t have a clear idea. It was difficult to decide on which aspect of the ship’s history to focus on, and how to transform that aspect to an engaging experience for visitors on deck. I wanted to explore the possibilities of dreaming big, but I soon learned about the practical limitations of some of my ideas. I have so many details about the sounds and smells of shipboard life from reading maritime literature, that I was especially interested in giving visitors sensory experiences on the ship. How about inviting visitors to dine on a tarp, like the enlisted men would have done, I suggested? As my supervisor, Jennifer gently reminded me of problems with cleanup and containment. Some of my other adventurous ideas—installing a tarp with fake blood, or salt to recreate the grainy texture from scrubbing the deck, or installing speakers in the masts—all presented similar problems. After talking to Jennifer and hearing her suggestions, I decided to build an activity for the ship based on the existing, Ready? Set, Fire! program in the museum. Ready? Set, Fire! is a program about cannon pressure where visitors build Alka-Seltzer cannons out of film canisters. Once I had made my decision, I knew that gunpowder would be the focal point of my program, and I shifted my research focus to gunpowder and powder passing. Powder passing is the process sailors used to get gunpowder from storage kegs below decks, up to guns on the gun and spar decks. The museum has many resources for information on passing powder on the USS—the responsible crew members, as well as timing and logistics. The most important historical resource for planning this program was the ship itself. I had an idea that a powder passing activity might be fun, but I needed to see parts of the ship I had never been to in order to in order to imagine the details. Luckily, I had the assistance and a full tour of the ship by Margherita Desy, a civilian employed by the navy as the ship’s historian. I was in a much better position to plan the logistics of this activity after my tour. I had originally wanted to start the powder line in the magazine, however after visiting it I decided that would be a bad idea. For example, the magazine, which is the room where the powder kegs are stored, is tiny! Only two or three people can fit into it at once, and it is difficult to climb down into. The Constitution Museum emphasizes a culture of collaboration. Once I had completed sufficient research on powder passing, and had a general idea for a powder passing activity between decks, I was able to run this idea by the museum educators in a meeting. I was met with enthusiasm and several good ideas. The collaboration between educators was energizing and inspiring, and left me wanting more collaborative experiences. Working alone in the research room meant that I had to create opportunities for such experiences, but minimize interrupting staff while they worked on their own projects. By the end of my internship with the USS Constitution Museum I was able to accomplish several of my original goals. I had been interested to learn about the job descriptions for different roles in the museum, in order to get a feel for what I might want to pursue in the museum field after graduation. I had one-on-one meetings with Harriet Slootbeek, Collections and Exhibits Manager; Robert Kiihne, Director of Exhibits; Jodie Smith, Manager of Academic Programs; Jennifer Zanolli, Manager of Interpretation and Visitor Services; Margherita Desy, Historian for USS Constitution; Carl Herzog, Public Historian; and several educators. I asked them about their jobs—their current job descriptions as well as what projects they are currently part of at the museum—and their past work experience. Though I haven’t decided what I would like to do most, I have a better idea of what is possible. Brainstorming, research, and collaboration in the museum helped me write a gallery guide for a new education program. Although I found my professional education experience useful, I learned to create a new type of lesson plan, and discover the institutional constraints that impact program development. I volunteered at the museum’s biggest annual fundraiser—a silent auction and dinner in the Seaport—and experienced the culmination of months of planning for the ship’s 220th birthday celebration (which included a Constitution shaped cake!). 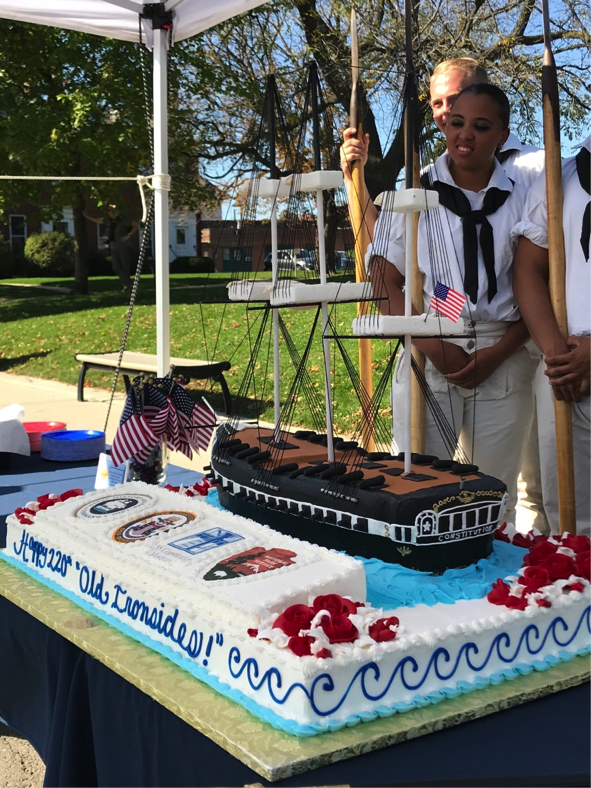 A Constitution shaped cake to celebrate the 220th birthday celebration for USS Constitution in the Boston Navy Yard. October 21, 2017. Photo by Genevieve Wallace. One of my biggest takeaways was how invigorating and inspiring it can be to work with a team of dedicated, and similarly nerdy, professionals who are all invested in the integrity of an institution and its mission. When I was working with a small team and I had people to share and build ideas with I was much happier and more productive than when I was working alone. Throughout the whole process of creating a program, I learned how much work and how many voices go into each final version. In the 1960s and 70s, the areas along Dudley Street in Boston’s Roxbury and Dorchester neighborhoods were the target of intentional disinvestment and isolation by Boston banks, public and private developers, even including the City of Boston. These individuals and groups were influenced by many motives, foremost among them a toxic mix of greed and racism. An initial refusal to provide individuals of color with access to mortgages and other financial loans, combined with developers secretly intimidating the neighborhood’s white residents, particularly Jews who had already paid off their mortgages, prompted departures, and ultimately led to a dismal housing market. 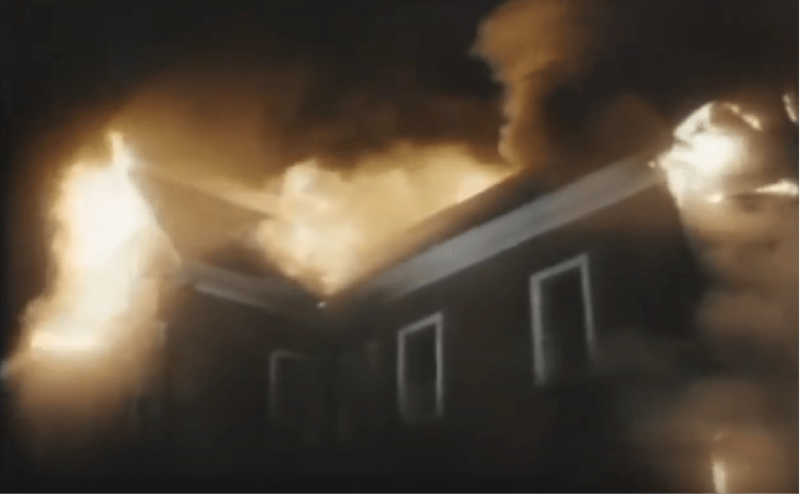 Houses started burning down almost every night, some torched by landlords eager to leave the neighborhood with the most cash possible—collecting homeowner’s insurance was known to produce a larger sum than selling property. Burned out lots became vacant. Vacant lots eventually became vacant blocks. 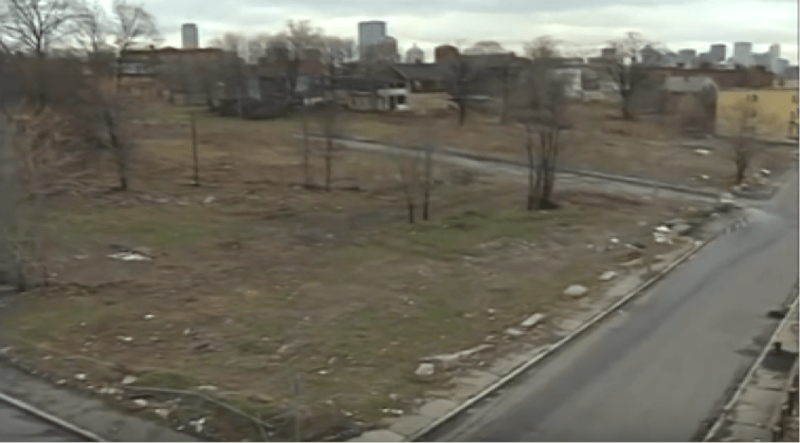 To add insult to injury, throughout the 1980s many outsiders to the neighborhood, including City contractors, used the lots as dumping grounds for the city’s trash. 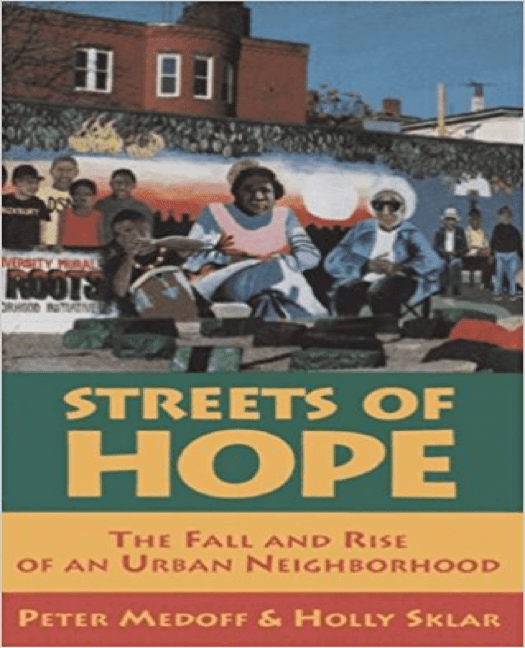 In response to the devastation, as well as the irrepressible belief that the neighborhood could be a successful urban neighborhood, community members organized the Dudley Street Neighborhood Initiative (DSNI) in 1984. Community members included residents, area business owners, and leaders of local nonprofits. DSNI’s mission is to empower Dudley residents to organize, plan for, create and control a vibrant, diverse and neighborhood in collaboration with community partners. The neighborhood’s residents specifically identify the right to a hazard-free environment, affordable housing, affordable childcare, education for and training of children and adults, and to be treated in a culturally sensitive manner by the wider society as major values. In short, DSNI is a community organization for the community, constituted and determined by the community. Most of its board members are residents and represent the four major ethnic/racial groups in the neighborhood (African American, Cape Verdean, Hispanic, White). Community youth as well as representatives of businesses, agencies, and religious organizations located in DSNI’s catchment area also sit on the Board. Since 1984, DSNI has undertaken a massive cleanup of the neighborhood’s vacant lots, won ownership of neighborhood land from the City of Boston, and built 226 new affordable homes on their property. DSNI is one of the only community organizations in the United States that owns city land. Effectively, this ownership means DSNI controls the terms of the land’s development, thus protecting its residents’from displacement that often accompanies development. Today DSNI still confronts the challenge of systemic dangers. The development of a new shopping, eating, movie-watching, and residential area a la Somerville’s Assembly Row fifteen minutes from DSNI’s headquarters, for instance, threatens Dudley Street neighbors with displacement by gentrification. But DSNI has a history of success in building a strong neighborhood that serves it residents and businesses. This past offers vital lessons for today’s challenges. Over the course of their 30 years, DSNI accomplished many of their goals and stabilized the community. Perhaps this history could serve a new generation of residents and activists, although there are very few published sources that narrate the history of this Boston neighborhood since the 1960s. This is what inspired Rosalind “Ros” Everdell, a recently retired long-time employee at DSNI, to undertake a neighborhood oral history project. Building on her long and deep connections with the diverse racial and cultural groups, individuals and organizations in the neighborhood, Ros conceived Neighborhood Voices–a cross-generational project that records spoken, first-person stories documenting the Dudley Street neighborhood history since the 1960s. The audio-recordings will be placed at UMass Boston’s University Archives and Special Collections in the Healey Library, and portions of the interviews will be uploaded onto the DSNI website. The project will ultimately produce over 20 individual interviews over the next two years. Although a relative newcomer to the Dudley Street neighborhood—I arrived in 2014—I developed a passion for the Neighborhood Voices project. My landlord, Bob Haas, had told me many stories of his own experiences in the neighborhood as a resident and active community organizer since 1971. The project also provided an opportunity for me to bring together my interests in community-based history, oral history, and my commitment to the neighborhood. Mentored by a skilled and experienced community organizer with a vision, I signed on as an intern to learn public history by doing, and create a program to train project participants, including myself, in some of the rudiments of oral history. I organized an oral history workshop to train resident interviewers, and produced materials on oral history procedures, and a pertinent history timeline to provide local, regional and national historical context. As a relative newcomer to the neighborhood, I had the opportunity to interview my landlord, and thus practice some of my emerging oral history skills. Blogpost author, Genny Peterson, right, interviewed Bob Haas for the Neigbhorhood Voices oral history project. Photo by Keiko Hiromi. Through interning with the Neighborhood Voices Project, I learned about the importance of personal connection and individual respect necessary in oral history work, versus the distant observation for which history is traditionally known. As a result of Ros Everdell’s personal networks built on relationship-building and respect and resulting from years of community organizing for better living conditions in the neighborhood, this project was possible and will continue to record the stories of the Dudley neighborhood residents. In September of 2017, I started my Public History internship with Historic Newton as an Education Collection Interpretation Intern. Historic Newton has a very active presence in their city. They were founded in the 1950s and today run two museums, The Jackson Homestead & Museum and the Durant-Kenrick House & Grounds. They also maintain the town’s historic cemeteries, offer many educational programs to their community including programs for adults and school children, and have online programs that include exhibits, historical information and teacher resources. Their mission is to illuminate their city’s history in the context of the nation’s history. Historic Newton is dedicated to providing educational opportunities, not only for Newton residents, but for the broader community via the world wide web. Historic Newton offers many educational programs for school age children, and these programs were the focus of my role as intern. In recent years, Historic Newton has developed a daylong lesson on old burying grounds in conjunction with Newton’s middle school teachers. 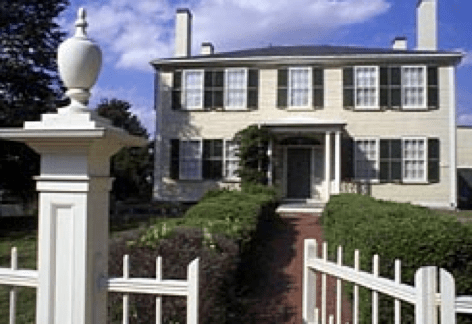 Their two museum spaces feature multiple exhibits on Newton’s history, including sections on slavery and the Underground Railroad, and the domestic life of a Newton family spanning over a century. 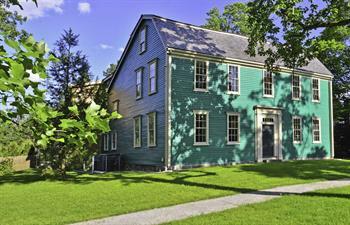 Online visitors can find exhibits on the Charles River, Newton artists, penny postcards, and the Underground Railroad. Currently, Historic Newton is writing a new curriculum on immigration and has several new programs in the works for the community. Over the last thirty years, museum education has become an integral part of exhibit planning. Before the 1960s, museums were spaces where people went to simply look at exhibits. In the 1970s, museums began to be thought of as nontraditional learning spaces (versus a traditional classroom setting) and history museum staff began developing exhibits with learning objectives in mind. As a result, there has been a shift from passive to active learning. Today, when people visit a museum they expect to learn something new from an exhibit, a community program, a walking tour, or an activity; most likely, a museum educator had a hand in its development. Museum educators are a vital component of a well-staffed museum. They are specialists who assist institutions in achieving their educational goals. Museum educators may work with a variety of people, whether they are in-house professionals, community residents, or local public school teachers, to develop programs that are both engaging and informative. Working with teachers on developing curriculums, results in lessons that are meaningful to students, respond to the curriculum, and that teachers are eager to teach. This kind of collaboration creates ownership for the project, which helps the community value the exhibit or program. Through collaboration and exhibit design, museum educators create meaningful programs, lessons, and exhibits for their participants. 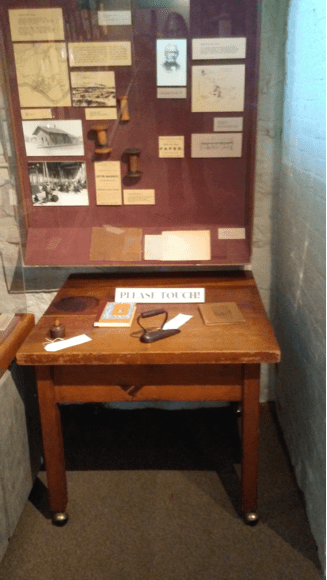 One of my responsibilities as an intern was to create a “please touch” table for our museum visitors. As the Education Collection Interpretation Intern, it was my turn to put these ideas and theories into practice. My responsibilities included updating the existing program “If You Lived in the Jackson Homestead” to make it more participatory for young audiences; creating a new exhibit for the “Please Touch” table in the Historic Newton Gallery; and researching items in their education collection for further use in Historic Newton’s educational programs. My goal was to create hands-on activities that allow young children to encounter the past in meaningful ways and engage them in age-appropriate historical thinking. 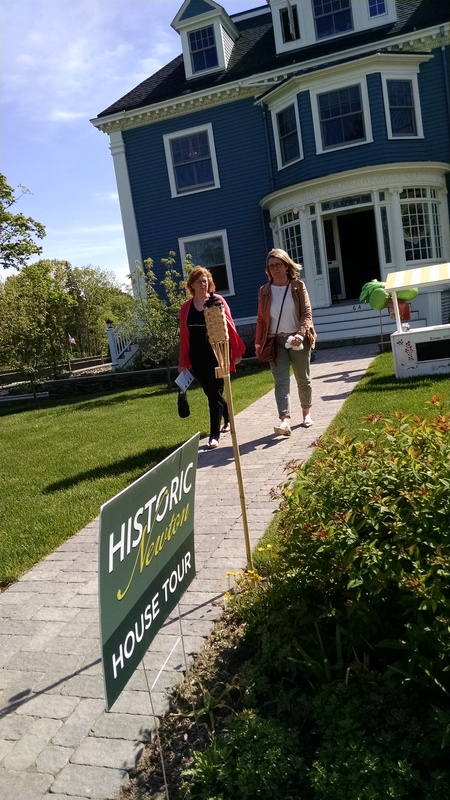 The “If You Lived at the Jackson Homestead” program is one of Historic Newton’s much loved and older programs, but both staff and visiting teachers identified the need to make it less lecture-based and more participatory for its young audiences. Feedback from teachers indicated a need for more resources for use in their classrooms to support this program. My initial observation of this hour-long lesson for children ages 4 to7 revealed the need for a new approach – these young children spent 30 minutes listening to the presenter deliver information before they had an opportunity to participate in a hands-on activity. My challenge was to figure out how to incorporate participatory elements into the 30-minute information-based session, to make it fun and meaningful for the children. I came up with several ideas then refined them with the help of Newton Public School teachers and Historic Newton staff. In addition, I revised objectives, artifacts, instructions, and follow-up for the existing artifact-handling activity, devising a game that allows children to practice comparing past and present through images of objects of the past and their versions in the present. This new approach to the activity and the other additions to this lesson added a strong participatory component, which better engaged the children. On Saturday, October 28, 2017, my phone rang out its shrill, soul-crushing alarm at 7:00 AM. And then 7:05. 7:10. At 7:45, I dragged myself out of the safety and coziness of my bed, threw on clothes, and placed an On-the-Go Dunkin Donuts order for a large coffee while brushing my teeth. “Add a turbo shot?” the app asked me. I hit yes and dashed out the door, pulling on my shoes as I ran. What was I, a twenty-two year-old graduate student, doing waking up so early the morning after a friend’s Halloween party—my first day off in weeks? Driving an hour to volunteer at a public history event, of course! The Mass Memories Road Show at UMass Boston is an event-based public history project that digitizes family photos and memories shared by the people of Massachusetts. Road Show volunteers work with members of the local community to organize a free public event where residents can contribute their photographs to a digital archive. To date, the project has digitized more than 6,000 photographs and stories from across the state, creating an educational resource of primary sources for future generations. On October 28, 2017, I volunteered at the project’s event in Marshfield. It was my first Road Show, and despite having attended a training session, I had no idea what to expect. Carolyn Goldstein, the Public History and Community Archives Program Manager at UMass Boston’s Archives and Special Collections, greeted me with a smile when I walked through the doors of Marshfield’s Ventress Memorial Library. She directed me to a medium-sized community room, where I saw volunteers of all ages milling around, chatting with one another and setting up their stations. Members of the local community had turned out in force, each excited to take an active role in documenting the history of their community. Several were elders with long memories of Marshfield’s history; some were history buffs; a few were even volunteers from other towns who had volunteered in previous Road Shows. I sat down at my designated station next to an affable woman named Maureen. She and her husband had moved to Marshfield the year before, hoping that a house by the beach would entice their grandchildren to visit more often. She had come to the Road Show because she wanted to become more involved in her new community, and to learn about its history in the process. As we waited for participants to arrive, Maureen and I went over our responsibilities. Our task was simple: we were to help participants fill out a form for each one of their photographs. We would ask them to title and describe their own photographs and to identify any relevant people, places, and events they captured. We were to allow people to tell their own stories, and to record the meanings that they assigned to each photograph. Our role was to listen, not to shape, suggest, or revise. All day long, I was humbled by the knowledge that participants were allowing me an intimate glimpse into their hearts and minds. They were showing me the people and places that they valued most in the world- memories held so dear that they were worth preserving for future generations. This was, truly, something special. It is an unfortunate but undeniable reality that archival repositories—digital and not—tend filled with records of the powerful. Their materials disproportionately focus on the lives of white men, the wealthy, the healthy, the well-connected. Those who lack privilege are chronically underrepresented in archival collections, and, too often, that absence leads to an erasure from history. Projects like the Mass. Memories Road Show, which empower people to construct their own archives, tip the balance of power by allowing ordinary people to shape the historical record. They gather together a wealth of material that the historians of the future can draw upon to construct a richer, more complete picture of the past. And that’s worth getting out of bed on a Saturday morning. The next Mass. 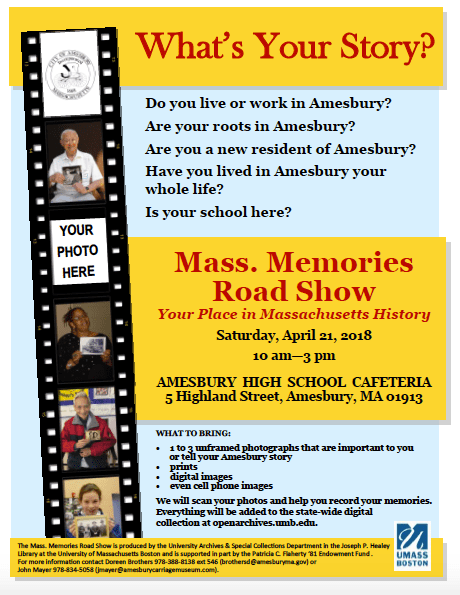 Memories Road Show will be in Amesbury, MA on Saturday, April 21st. A full schedule of Spring events can be found here. Flyer for the upcoming Road Show in Amesbury, MA. In the summer of 2016, volunteers petitioned throughout the state of Massachusetts to put Question 3 on the ballot. The question involved increasing the amount of space farm animals were given in Massachusetts, affected issues of food safety, and passed in a landslide that November. Some of the flyers and a bumper sticker from the Question 3 campaign. At the time, I was completing an MA in History and began working as an intern at the Boston City Archives. I used documents I found at the archive to write about women and African Americans who influenced Boston history. The one that stuck out to me the most was Ida M. Hebbard. Hebbard presided over the Housekeepers League during the 1910s and protested the surging prices of basic goods. She held various meetings about public health, worried about the cost of living for struggling families, and advocated for laws which affected food safety and animal welfare. About a hundred years later, the activists petitioning for Question 3 would follow in her footsteps. 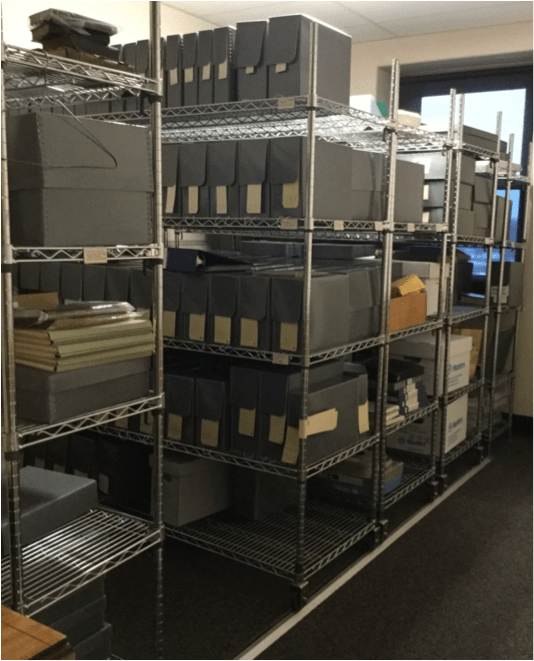 Although it looks small, the record room at the MSPCA Archive contains hundreds of documents detailing the history of animal legislation in Massachusetts, throughout the country, and abroad. Inspired by Hebbard, I initially wanted my capstone project to tell the story of animal welfare organizations in the Boston area and thought about creating an online exhibit. So when Jan Holmquist took me on a tour of the archive at the Massachusetts Society for the Prevention of Cruelty to Animals, I came in with my original idea in mind. However, at end my visit I had already scrapped that idea and decided to make the MSPCA Archive more accessible to researchers by creating a finding aid. Much of the archive was already processed, but a 2008 fire had set back progress. There was also no concrete list of what records the MSPCA had; researchers needed to email Holmquist first to see if what they needed was there or make an appointment and hope that it was. Although there was a lot of work to be done, I was excited to get started. In 1867, philanthropist and activist, Emily Warren Appleton traveled to New York and met with Henry Bergh. 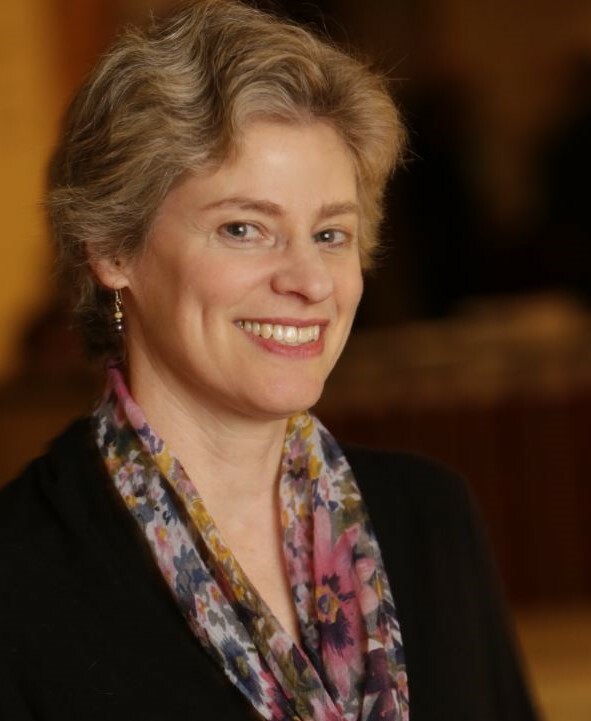 The founder of the American Society for the Prevention of Cruelty to Animals (ASPCA) offered her advice on founding a similar organization in Massachusetts. Upon returning to Boston, she located the men who would become the MSPCA’s first donors and began working on a charter. A year later, George Thorndike Angell published an editorial in response to two horses that were raced to death after traveling a distance of forty miles. Appleton immediately went to Angell’s office after seeing the article, and together they founded the MSPCA. Angell became the first president; during his term, the organization pushed for the passage of multiple anti cruelty laws, published “Our Dumb Animals,” created the first American Band of Mercy, and began the distribution of children’s classics like Black Beauty or Beautiful Joe. 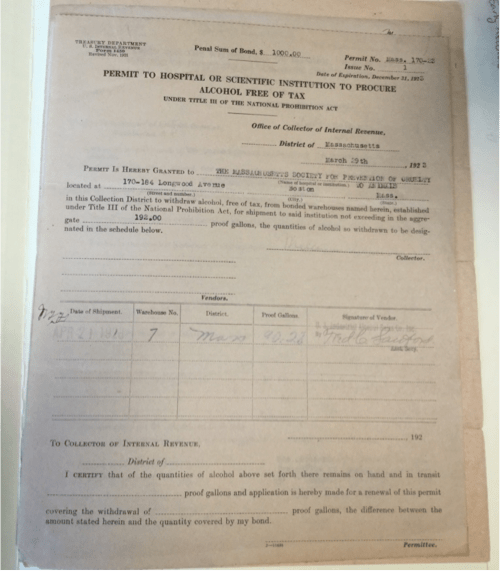 During prohibition, Angell Memorial Hospital needed to apply for a permit to use alcohol in the hospital. This is that application. Dr. Francis Rowley took Angell’s place as the MSPCA’s second president in 1910 when Angell passed away in 1909. Rowley expanded the influence of the MSPCA. He oversaw the creation of the first MSPCA shelters and Angell Memorial Hospital. The hospital would be at the forefront of new practices in veterinary medicine, like the world’s first veterinary intern training program in 1940 or the first successful feline kidney transplant in 1997. Rowley also helped build the American Fondouk Maintenance Committee in 1929, a humane organization in Fez, Morocco. This event served as the first of many instances where the MSPCA fought for animal welfare abroad. 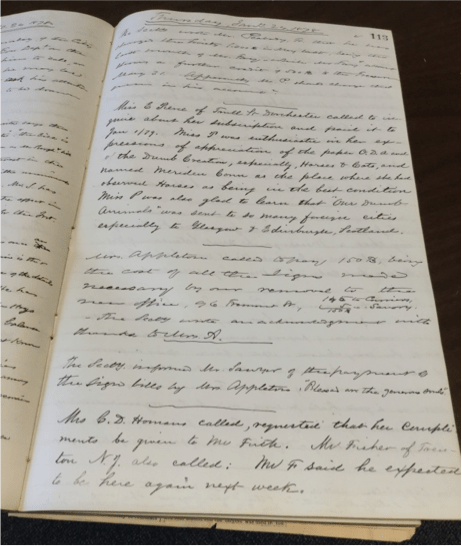 In the late 1800s, the MSPCA secretary kept a daily log. Researchers can use these logs to find mentions of Emily Warren Appleton, various donors, or typical days at the organization. Despite the accomplishments of Appleton, Angell, and Rowley, many of their letters and documents may have been lost in the 2008 fire. 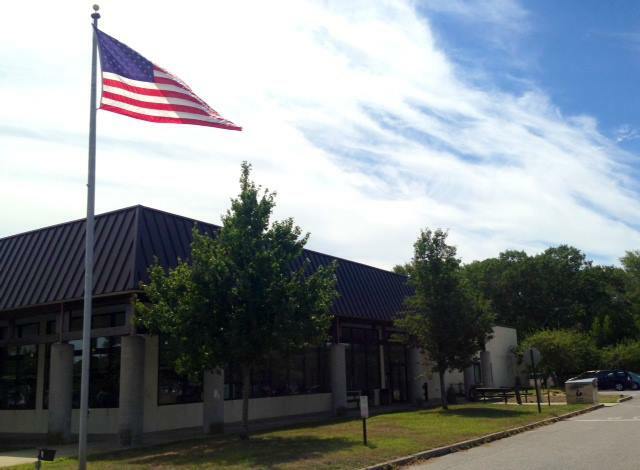 I began my work at the MSPCA going through Angell’s correspondence and early records. A portion of the letters between Angell and his mother were burnt or missing. However, the correspondence that did survive gives insight into Angell’s upbringing and character. Even rarer, though, are records from Appleton and Rowley in their hand. The MSPCA Archives has a copy of Appleton’s will and she’s mentioned in various record books, but not much else. Only a few of Rowley’s letters survived the fire. It’s impossible to know just how much was lost, because of a lack of a finding aid before the fire. After surveying early records, I began processing documents that were still disorganized from the fire. In about five boxes, I found records from the American Fondouk, correspondence from MSPCA employees, and many media clippings. 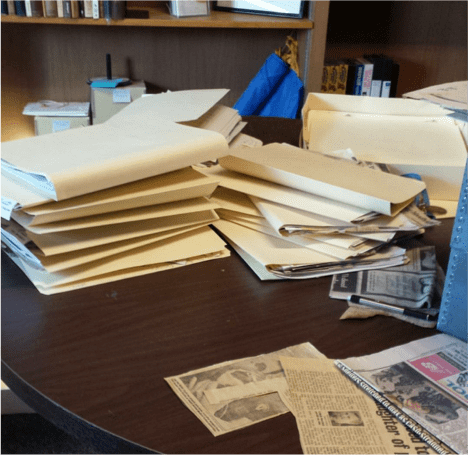 The MSPCA Archive had amassed a large collection of newspaper and magazine clippings that mentioned the organization, the hospital, its many shelters, and other organizations that they were connected to. The clippings ranged from the early 1900s to the 2000s, the majority of which were from the 1970s up through 2005. While it would have been great to scan the clippings, as newsprint doesn’t preserve well, I had no means of doing that. So I spent time putting all of these clippings in chronological order and into boxes by decade. I learned a lot about animal welfare history in the 20th century from these clippings. For example, the MSPCA worked with the Franklin Park Zoo in the late 1970s and early 1980s to upgrade the zoo and improve conditions. I would sometimes separate articles not just chronologically, but by event as well. I did so with articles about the zoo in the 1970s. This is just a small look at some of the newspaper articles I organized in the fall of 2017. 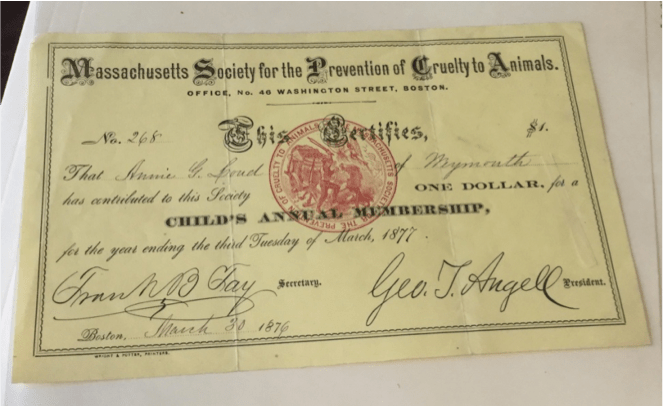 When going through the records of the MSPCA and creating the finding aid, I not only learned a lot about animal welfare history, but I also realized how a collection can take a toll on the archivist processing it. Sometimes the subjects presented can hit close to home, and this was especially true with how big animal welfare had become in my life. The records at the MSPCA mentioned various issues like donkey basketball, greyhound racing, and instances of animal rescue during natural disasters. In addition to records of successful legislation and uplifting stories, there were also images of animal cruelty. Around the 1950s, employees at the MSPCA wrote to various companies which sold humane stunners and pistols asking for brochures. I also had to process articles on different methods of euthanasia. This aspect of the collection, while important to preserve, was particularly hard for me to look at. Since its inception, the MSPCA has offered membership for those who wanted to support animal welfare in the state. Here’s a child’s membership from 1877. Coming into this project, I was extremely attached to the subject matter. I wanted to list every single record I came across. My finding aid would include everything from documents and photographs to audiovisual material and medals. In the middle of my project, my advisor, Dr. Marilyn Morgan, confronted me with reality. She told me that processing and recording everything at the MSPCA was impossible if I wanted to graduate in December. She also made me realize that my time at the archive wouldn’t have to end when I submitted my finding aid. With her guidance, I focused on what I could actually get done within the time I had. I began selectively processing and recording things. I listed all of the boxes on the finding aid, but not all of the folders inside of them. For example, I didn’t list all of the folders for the many boxes of publications. I knew that any researcher looking for a newsletter or magazine could find what they needed in the labeled boxes and all the folders within them were in alphabetical order. My finding aid ended up focusing entirely on the documents and a small portion of the books. The photographs, audiovisual items, oversized materials, and ephemera needed to be left for another time. 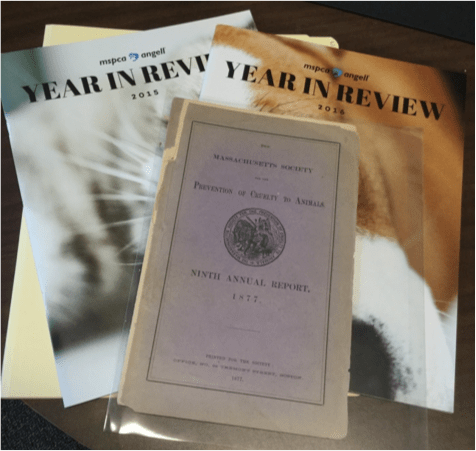 Since the late 1800s, the MSPCA has published annual reports detailing the major accomplishments of the past year. These reports are readily available for researchers. That time came less than two months after I submitted my finding aid and graduated. I became a consultant in February. I work a few hours a week helping Jan Holmquist keep up with the archive. This includes processing new materials, adding to the finding aid, researching the history of the MSPCA, and finally being able to go through all the materials I missed last time around. The project I’m most excited about is going to various archives and learning more about Emily Warren Appleton. 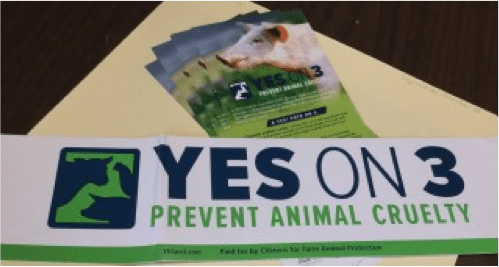 Animal welfare activism has grown in the last decade, and while Massachusetts has been on the forefront of this issue since 1641, the history isn’t too readily available yet. I know that my work will change that. The past will become more accessible to researchers and activists will be able to learn about how far animal welfare has come in almost four hundred years.